Fetchable with Trinket Mage, but it’s going to be really helpful in those colorless EDH decks. If you exile a General, they can just bring it back, so it’s not the end all be all for those cards, but it does give Green and Blue was to deal with problem creatures for good. Unlike awesome tricks with Mangara of Corondor, you have to exile this along with the creature, so no Voltaic Key tricks. If Sensei’s Divining Top we were banned (for reasons unknown) this would easily take the place. Ignore for the fact that this costs two more, it Scrys 2, which is something the Top can’t do. There have been plenty of times where I’ve had no shuffle effects in play and a Top and I couldn’t dig my way out of a situation. This solves that by putting the unneeded cards on the bottom of my library and get to the good stuff. I used to play Mystic Speculation in my Blue decks, but no longer as this will replace it. Including the fact that you can order the top of your library like Top, I will gladly play both side by side. Is this better than Feldon’s Cane? Well, does cost 2 mana to use, but it does gain you 5 life and shuffle itself into your library along with your graveyard. If you’re looking for ways to prolong the game, this is it. It’s a cute card that may get the ire of your playgroup if you constantly shuffle and play it. Have fun. A fun multiplayer card where 2 life doesn’t mean a whole bunch until later in the game. Whenever I think of this card I think of the idol from the Brady Bunch. I know full well that joke works with like 2 of my readers. I’ve seen Platinum Angel get some play in EDH from time to time depending on the decks that they’re facing. There’s a lot of steal effects in the format so while you think this is cute for you, don’t be surprised if it does end up in the hands of another person. Always protect the Angel. Six mana to draw three cards isn’t always the best deal unless you’re in a color that doesn’t have access to that many draw cards. Yes, the Voltaic Key trick does work with this card if you win both flips, so pack your Krark’s Thumb. Obviously you want this with artifact creatures. Might I suggest a General to pair this with instead of Karn? How about Experiment Kraj? Suddenly, you can untap Experiment Kraj if you have five creatures in play (Altar Golem) and give all your artifact creatures +1/+1 counters since the Steel Overseer gives itself one as well. You know, that’s just a suggestion. I already talked about this equipment on MTGColorPie.com last week, but the question of putting this into your deck depends on your play style of equipment. If you want all out attacking creatures, then sure, put it in there. It won’t do tricks like Skullclamp or Jitte does, but it’ll get the job done. Yes, it’s a beatstick and should be destroyed if all possible. A new multiplayer favorite. Now you’ll be able to decide when players get to draw instead of the horrible position of letting everyone else draw cards before you. Yes, this will be a staple in Group Hug decks and there are some devious things you can do with it with the “Words of” Onslaught cycle. Might I instead suggest Mind’s Eye; end of turn, everyone draws a card, you pay 3 and draw 3 more. Seems ok.
Is a construct, not a contraption. Gives Blue and Green that direct damage. Combos well with Steel Overseer. There will be a post next week detailing all of the artifacts this card is good with. It’s a pretty long list. Gives your General shroud and makes it unblockable. Yeah a staple in EDH decks. This is it’s 5th printing. Everyone should have one by now. I actually don’t like these in EDH. The Worldwake man lands are better and also the Pain lands. Listen, these are better when you’re relying on more than one of in a deck, but the Invasion duals and Shards Tri-lands are just better in random hands such as EDH. A “fixed” Maze of Ith. While you can’t target your own creature to do crazy tricks with it you can target it at opposing Generals attacking you. You know that whole 21 General damage? What if you could help prevent that. Plus, when it does reenter the battlefield, it becomes tapped until their next untap step leaving them open to other attacks from other players. This ability to almost never be dead makes it a hugely powerful card. This is the reason why it’s ok to have cards like Strip Mine and Wasteland. If you don’t have fetch lands, you have this land. Really solid, sees play all the time. This has been the third review where a Green card (second Green creature) has come out on top. Am I bias for Green? No, I just think that for the past 3 sets, they’ve gotten the goods for EDH. Serra Ascendant does make the Top 10, just not number one. I hope you guys enjoyed this whole thing. Did I miss anything you think I should’ve? Disagree with my Top 10 list? I’d love to hear your thoughts. If you excuse me, I’ll be icing my fingers. 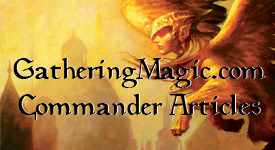 This entry was posted on Thursday, July 15th, 2010 at 8:54 pm	and posted in EDH, M11, Magic: the Gathering, Really Big EDH Review. You can follow any responses to this entry through the RSS 2.0 feed. I am mildly surprised Brittle Effigy didn’t make top 10; it seems better than Dark Tutelage to me. I would disagree on both Dark Tutelage and Hoarding Dragon being in the top 10. Tutelage is very deck specific because it hurts so much in tradition high-curve EDH decks. Hoarding Dragon is frustratingly risky because everyone can see what you tutor for and they can bounce/exile your dragon to dispose of it permanently. Sun Titan should be #2. He Eternal witness’ baby daddy. Just for the hijinx that’s capable of it should be 2. Add in the fact that it interacts with so many good cards like Strip Mine (or any saccable lands), Sterling Grove, synergy with sac outlets, will being back key things like Aura shards, equipment, etc…the shenanigans this guy is capable of with flicker type effects, hell 5 of your top 10 list should they end up in the yard. Someone, somewhere, will find a way to abuse this guy. Don’t get me wrong, your 2 and 3 are good cards. but I wouldn’t be shocked if they didn’t make the cut to 99 in many decks (although the land should always be able to slip in. This guy should be in almost any deck packing white…and his impact will surely be more noticeable than those. I liked this kind of review, it was light and not entirely technical, besides it gave a few ideas on how to build my EDH deck from now on. My group is still young in this format, and most likely they won’t be updating in a while so I will have the edge. I am a red player, but I just don’t seem the “awesome” in hoarding dragon. Yeah it’s a nice fetch but…. that’s it. Maybe if I played it I would understand. I would almost always use Akroma’s Memorial over Sword of Vengeance.